Faith Formation Registration is OPEN! For information on grades K-5 and First Communion, please contact Mandy Westrich or call 531-7721, ext. 129. For information on middle school, high school, Confirmation and adult faith formation, please contact Sherri Briand or call 531-7721, ext. 122. We are called to be true disciples of Jesus Christ who know, love, and serve God more and more each day. 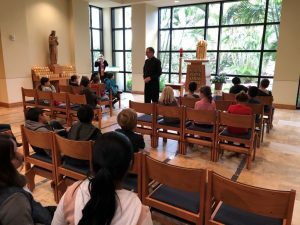 To help you in passing on the faith to your children, we offer weekly faith formation classes on Sundays from10:15am-11:30am. Each session starts with a 15-minute gathering for parents and all children and then children are dismissed to their grade level class. We highly encourage children to participate every year. Our sessions meet on Sunday mornings 10:15 –11:00 am (Grades K–5) and Sunday evenings 4:00–5:50 pm (Grades 6–12). First Communion and Confirmation will be four Saturday sessions 8:00 am–12:00 noon. Baptism class is the first Sunday of each month 10:15 am–11:15 am. The best for to grow in faith is to teach others! It is also a powerful witness for our children to see their parents/grandparents/Godparents serving in their parish. There are many roles—something for everyone! 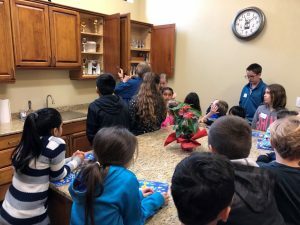 • Catechists/Assistant Catechists: This is the heart of our ministry. Discover the joy of sharing your faith in a simple way with children each week. We provide the curriculum and mentor all new catechists. 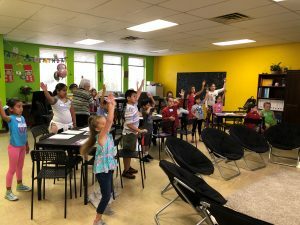 Why not help in your child’s class? They’ll love it! • Teen Aides: Help in the classroom each week. This is a great way for teens to learn to become catechists and earn service hours. • Substitutes: What is your availability? We can always use your help on an as needed basis. • Security Team: Help keep our kids safe by walking the campus together during our sessions. • Office Team: We always need lots of help with simple projects. You can help during the daytime or in the evening during your child’s session. • Hospitality Team: We serve dinner with a smile on Sunday evenings beginning at 4:00 p.m.
• Photography/Video: We capture moments of grace every week to share with the rest of the parish! Want updates on your time? Faith Formation uses Remind to communicate. Click below to download the instruction forms. Join us Sundays from 10:15-11:30. Click Here to download a copy of the 2018/2019 Faith Formation Class Schedule. Here are a few pics from First Communion preparation class on December 2. The kids had a great time. We learned the act of contrition and toured the confessional with Fr. Jack Marino. We emphasized that reconciliation is a celebration. Our snack was a celebration complete with balloons and decorate your own cupcakes. 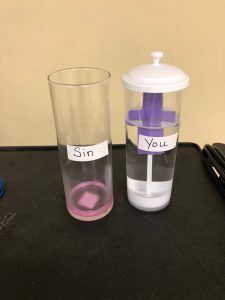 We even did a science experiment demonstrating how sin makes us dirty and when we go to confession, we are made clean again. 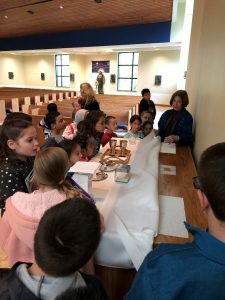 We had our 3rd Super Saturday First Communion Preparation Session on Saturday January 26th. 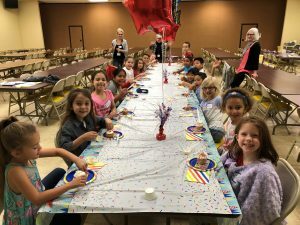 The children preparing for First Communion learned about being part of the Church and their place in the family of God. 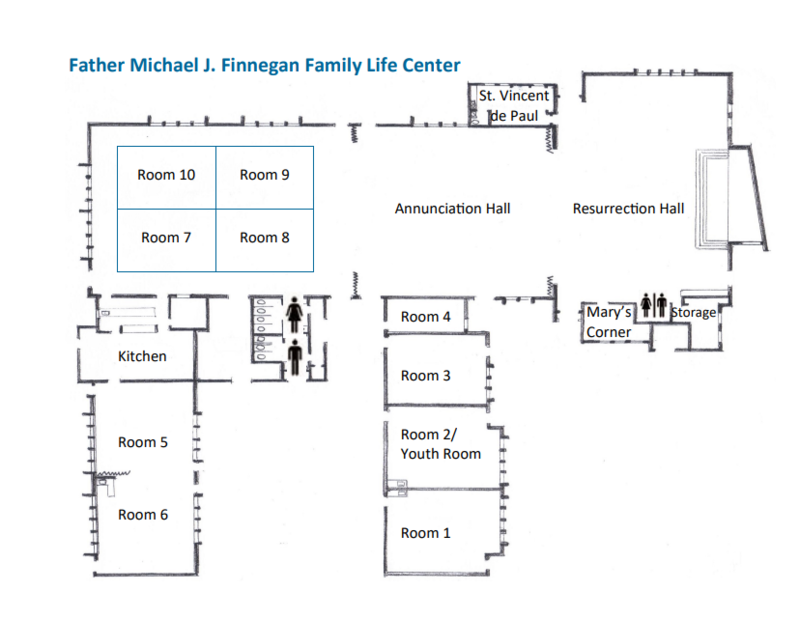 They took a very in-depth tour of the Church and all of its symbolism, the Sacristy, Chapel and vestment rooms. They are excited to share what they learned with their Church family. Special thanks to Fr. Jack, Anita Hamrock and the dedicated catechists for helping to make this day so memorable for the children.